Me and Penny meet for the first time in fifty years! Wow, where does one start with this blog. What a fabulous fortnight of Rocking, seeing lovely friends again and simply having the best possible time. The food and wine flowed endlessly, and my man, who was the star of the whole period, calmly accepted that he had to share our little villa with five girlies for five days! I was incredibly pleased to have my old Grammar School friend Penny from Australia staying. We had not seen each other for fifty years, yes really! I know you can’t believe I’m old enough, neither can I! The Rock Chick Band Rocking with the sister-in-law joining in on backing vocals. You will notice that I have updated the banner at the top of the page with the band group hug taken on 20th June. The guys were absolutely brilliant and we had a really good stand in drummer as Mario was involved with a family event. Family events take presidence over anything else here in Italy, and my beautiful daughter and granddaughter quite naturally came to my bash. 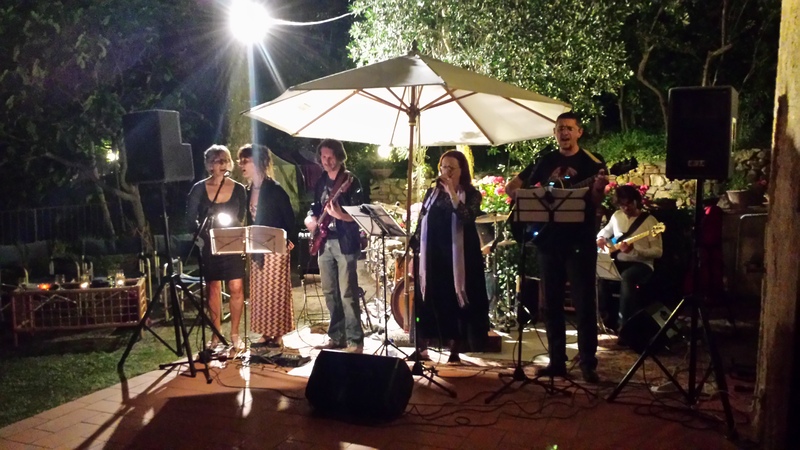 This part of Tuscany is alive with music events this time of year, so I must say a big thank you to all those lovely people who supported my event despite the competition elsewhere. I decided to go all Rock Chick black this year and at the last moment threw a scarf around my neck. If anyone else mentions the Vicar of Dibley, I’ll throttle them! 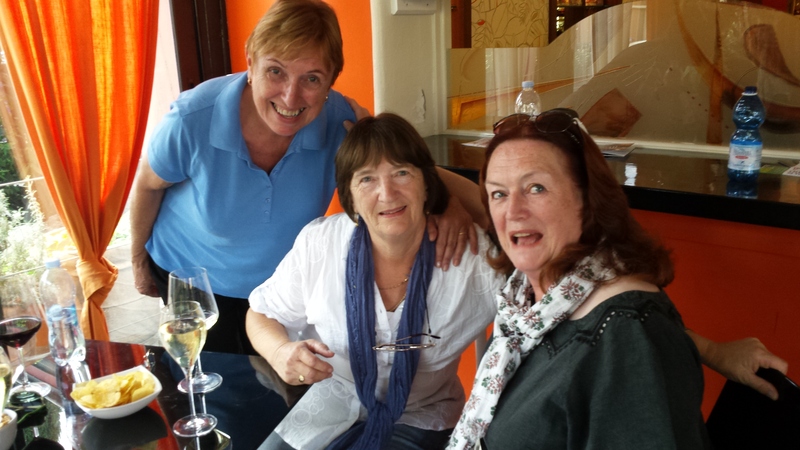 Penny, Hilary and me at Certaldo Alto. I took the girlies up to Certaldo Alto on the Monday and they spent a couple of hours ‘ahing and ooing’. Certaldo Alto is the historic centre of Certaldo up on a hill, which is reached by a funiculare train and was packed with tourists! 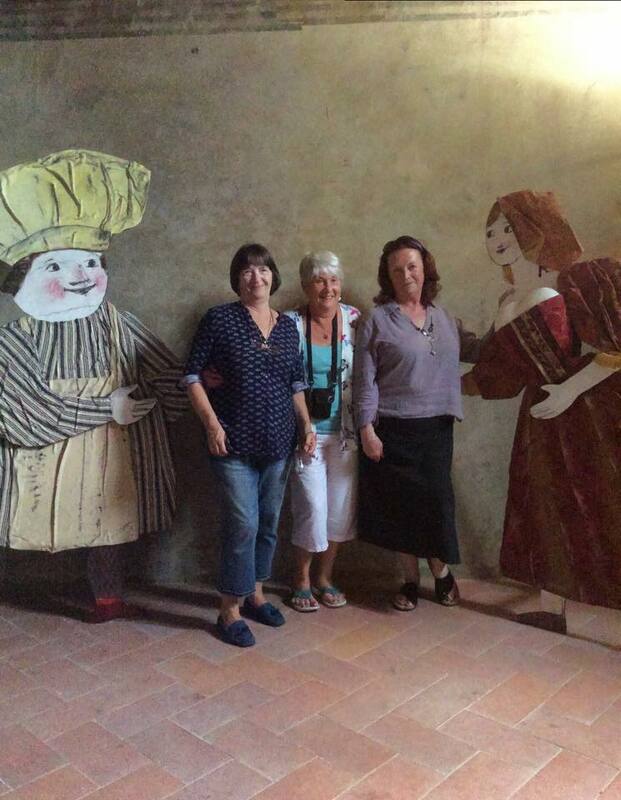 We had a fantastic time, however, we ended up exhausted and flopped down at a table in the garden terrace of Il Castello http://www.albergoilcastello.it and were forced to eat the most delicious lunch. I am taking my man there on Thursday and despite only living fifteen minutes away, we have never eaten there before! It’s another one to add to our list of places to eat. 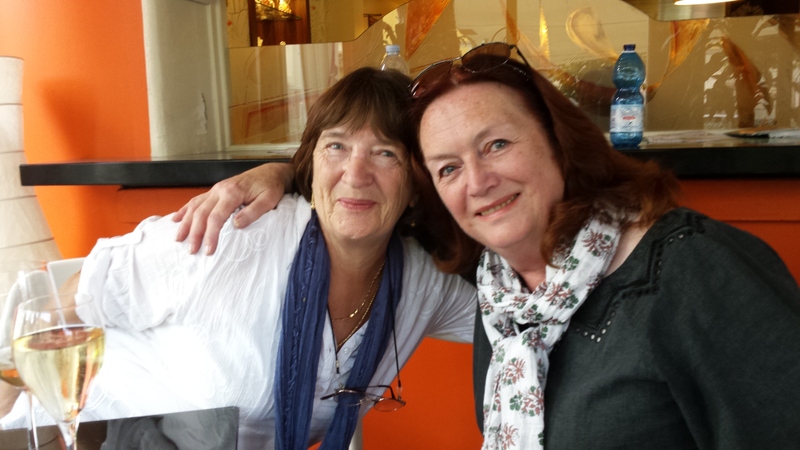 On 23rd June my lovely English friend Hilary and I had a joint birthday celebration, opening our presents at Bar Solferino in Certaldo over morning coffee. Thank you to the adorable Hilary for your amazing ability to whisk the washing up away without our realising it and spoiling us rotten! Also to our new friend Rose from Australia, who made the most delicious pear crumble, which my man is still waxing lyrical about. Our house guests were the best we could ever hope for and not to forget my beautiful sister-in-law who did all the summer plant pots before the concert. Thank you everyone and I will miss you terribly. Well, it’s already Tuesday and I really must get this blog off to you. I will update you on Silvio’s activities next weekend. Have a great week, do drop me a line and don’t forget to visit my books on Amazon. PS We are attempting to get some videos sorted to go on YouTube, I’ll let you know when they are up there! Sounds like the concert was great fun once again! Wish we could have been there.